This is the fifth post in a collaborative series titled “Environmental Historians Debate: Can Nuclear Power Solve Climate Change?”. It is hosted by the Network in Canadian History & Environment, the Climate History Network, and ActiveHistory.ca. Nuclear power is back, riding on the growing fears of a catastrophic climate change that lurks around the corner. The looming climate crisis has rekindled heated debate over the advantages and disadvantages of nuclear power. 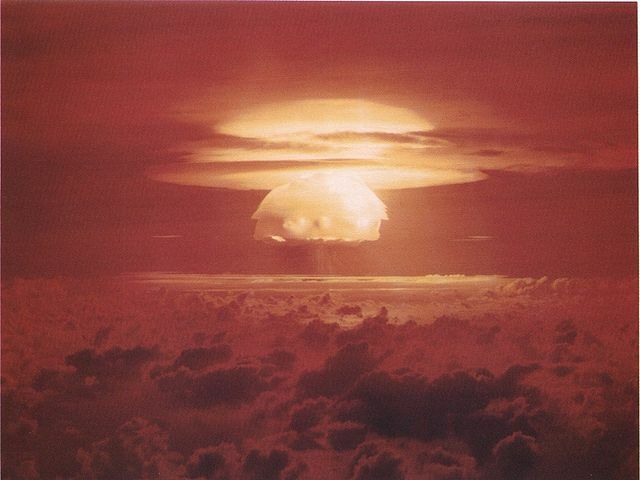 However, advocates and opponents alike tend to overlook or downplay a unique risk that sets atomic energy apart from all other energy sources: proliferation of nuclear weapons. Despite the lasting tragedy of the 2011 Fukushima disaster, the elusive goal of nuclear safety, and the stalled progress in radioactive waste disposal, nuclear power has once again captivated the world as a low-carbon energy solution. According to the latest IPCC report, released in October 2018, most of the 89 available pathways to limiting warming to 1.5 oC above pre-industrial levels see a larger role for nuclear power in the future. The median values in global nuclear electricity generation across these scenarios increase from 10.84 to 22.64 exajoule by 2050. But the justified focus on energy production vis-à-vis climate change obscures the debate that until recently had defined the nuclear issue: weapons proliferation. It is often said that a global nuclear regulatory regime, grounded on the 1968 Nuclear Non-Proliferation Treaty (NPT) and the International Atomic Energy Agency (IAEA)’s safeguards system, has proven successful as a check against the diversion of fissile materials from peaceful to military uses. There is indeed a good reason for this optimism. Since 1968, only three countries (India, Pakistan, North Korea) have publicly declared possession of nuclear weapons – a far cry from “15 or 20 or 25 nations” that President Kennedy famously predicted would go nuclear by the 1970s. Contrary to the impressions created by the biological metaphor, as political scientist Benoit Pelopidas has pointed out, the “proliferation” of nuclear weapons is also neither inevitable nor irreversible. South Africa, a non-NPT country which had secretly developed nuclear weapons by the 1980s, voluntarily dismantled its arsenal following the end of Apartheid. Belarus, Kazakhstan, and Ukraine, which inherited nuclear warheads following the collapse of the Soviet Union in 1991, also agreed to transfer them to Russia. Moreover, despite all the talk about the threat of nuclear terrorism, experts note a multitude of obstacles, both technical and political, for non-state actors to steal or assemble workable atomic devices. Although many countries and terrorists are known to have harbored nuclear ambition at one point or another in the past – and some undoubtedly still do so today – we should not exaggerate the possibility of nuclear weapons acquisition by new countries and violent non-state actors and the potential threat that it might pose to international security. The real dangers of nuclear proliferation, however, lie elsewhere. The NPT is supposed to be a bargain between the nuclear haves and have-nots. The non-nuclear countries agreed not to acquire or manufacture nuclear weapons in exchange for the pledge made by all parties, including the five nuclear-weapon states designated by the NPT (United States, Soviet Union/Russia, United Kingdom, France, and China), to “pursue negotiations in good faith on effective measures relating to cessation of the nuclear arms race at an early date and to nuclear disarmament.” The nuclear-armed countries, however, have consistently failed to keep their end of the deal. Meanwhile, the United States has repeatedly used or threatened to use military force to disarm hostile countries suspected to have clandestine nuclear weapons programs. Iraq is the most famous example of this, but as discussed below, U.S. officials also seriously considered preemptive attacks against nuclear facilities in China and North Korea. The United States is not alone in its penchant for unilateral military action. Israel, a U.S. ally widely believed to possess nuclear weapons, has also carried out a number of surprise airstrikes that destroyed an Iraqi nuclear reactor in 1981 and a suspected Syrian installation in 2007. The alleged “success” of the repeated use of force and its threat to stem the tide of nuclear proliferation, however, comes at a high cost. Such action may not only deepen the insecurity of the threatened nation and make it all the more determined to develop its nuclear capabilities as a deterrent, but also entails a serious risk of unintended escalation to a large-scale conflict. Anyone who tries to weigh the value of nuclear power in coping with the climate crisis thus must take stock of the history of militarized counter-proliferation policy that reflects and reinforces what historian Shane J. Maddock has called “nuclear apartheid,” a hierarchy of nations grounded on power inequality between the nuclear haves and have-nots. In October 1964, the People’s Republic of China successfully tested an atomic bomb, becoming the fifth country that demonstrated its nuclear weapons capabilities. The United States eventually acquiesced China’s nuclear status by the time it signed the NPT in 1968, which formally defined the nuclear-weapon state as a country that had manufactured and detonated a nuclear device prior to January 1, 1967. Washington’s decision to tolerate a nuclear China, however, did not come without resistance. In fact, as historian Francis J. Gavin has noted, there is a striking parallelism between the U.S. perception of China during the 1960s and that of a “rogue state” today: China had already clashed with the United States during the Korean War, twice shelled the outlying islands of Taiwan, and invaded India over a disputed border; it strongly disputed the Soviet Union’s leadership in the Communist world and aggressively supported revolutionary forces around the world; and it consolidated a one-party rule and embarked on a series of disastrous political, economic, and social campaigns, most notably the Great Leap Forward and the Cultural Revolution. Operating from the Cold War mindset, and with little information shedding light on the complexity of China’s foreign and domestic policies, senior U.S. officials feared that China’s nuclear weapons program would post a serious threat to the stability of East Asia and the international effort to prevent the further spread of nuclear weapons around the world. It is important to note that not all U.S. officials held such a grim view about China’s nuclear ambition and its consequences. Some believed that a nuclear-armed China would act rather cautiously, and President John F. Kennedy and Lyndon B. Johnson both tried to induce China by diplomatic means to abandon its nuclear program. As historians William Burr and Jeffrey T. Richelson have demonstrated, however, the Kennedy and Johnson administrations also developed contingency plans to disarm China by force. In a memo written in April 1963, the Joint Chiefs of Staff discussed a variety of military options, ranging from covert operations to the use of a tactical nuclear weapon, to coerce China into signing a test ban treaty. Despite all the talks about the use of force, the U.S. government ultimately refrained from taking such drastic action. The Soviet Union refused to discuss the possibility of joint military intervention, and the political costs and military risks of an unprovoked attack were too high. The failure to stop China’s nuclear weapons program, Gavin has pointed out, precipitated a major shift in U.S. nuclear policy toward creating a global nonproliferation regime with the NPT as its keystone. However, these “proliferation lessons from the 1960s,” as Gavin has called, did not change the fundamental fact that the United States was willing to contemplate military action, to be carried out unilaterally if necessary, to prevent hostile countries from acquiring nuclear weapons. If any the NPT became a handy justification for such measures. This was abundantly clear when North Korea triggered another nuclear crisis thirty years later. In March 1993, North Korea startled the world by announcing its decision to withdraw from the NPT. At issue was the IAEA’s demand for special inspections at nuclear facilities in Yongbyon to account for the amount of plutonium generated in an earlier uninspected refueling operation. The tension briefly subsided when, after bilateral talks with the United States, Pyongyang suspended the process of pulling out of the NPT and agreed to allow inspections at a number of installations. In March 1994, however, North Korea suddenly reversed its attitude, blocking IAEA inspectors from conducting activities necessary to complete their mission. The United States responded by declaring its intention to ask the United Nations Security Council to impose economic sanctions against North Korea. The self-restraint of the Clinton administration and its commitment to a diplomatic solution have earned praise from many scholars and pundits – in sharp contrast to George W. Bush’s aggressive unilateralism. But the fact remains that Clinton and his aides considered the threat of preventive military action as permissible, even essential, to pressure North Korea into refraining from any suspicious nuclear activities. And their willingness to go to the brink of actual conflict created the tense policy environment that greatly diminished room for quiet diplomacy for a possible compromise while drastically raising the risk of accidents and miscalculations. In this sense, the “peaceful” conclusion of the first North Korean nuclear crisis was a Pyrrhic one, reinforcing the belief widely held by the U.S. policy community that the United States must be prepared to use its military force unilaterally to uphold the global non-proliferation regime. It is thus no coincidence that, even after the disastrous outcomes of the Iraqi War fought in the name of nuclear nonproliferation, the U.S. government still continues to wage the dangerous game of brinkmanship with hostile powers suspected of pursuing the clandestine development of nuclear weapons. What does the history of U.S. counter-proliferation policy mean for the future use of nuclear power to combat climate change? An answer, I believe, lies in an accelerating shift in the nuclear geography. The New Policies Scenario of the International Energy Agency’s World Energy Outlook 2018, a global energy trend forecast based on policies and targets announced by governments, shows that the demand for nuclear power in 2017-40 will decrease in advanced economies by 60 Mtoe (millions of tons of oil equivalent), whereas it will increase in developing economies by 344 Mtoe. Of approximately 30 countries which are currently considering, planning, or starting nuclear power programs, many are post-colonial and post-socialist countries located in areas, including Central Asia, Eastern Europe, the Middle East, and South and Southeast Asia, where the United States is competing with other major and regional powers for greater influence. Added to this geopolitical layer is the nuclear supply game. While many Western conglomerates have recently decided to exit from nuclear exports due to swelling construction costs, Russian and Chinese state-owned companies have aggressively sold nuclear power plants to emerging countries, a move backed by their governments as part of their global strategies. Although Russia and China have generally cooperated with the United States in controlling nuclear exports, the recent U.S. withdrawal from the Iran nuclear deal has pitted Washington against Moscow and Beijing over the latter’s continued negotiations with Iran for nuclear cooperation. Given the growing tension between the United States on the one hand and Russia and China on the other, the expansion of civilian nuclear programs in key strategic regions is likely to be fraught with serious risks of an international crisis and even an armed conflict. The fundamental solution to the nuclear dilemma in the changing climate is simple: carry out the pledge made by all parties to the NPT, that is, to “pursue negotiations in good faith on effective measures relating to cessation of the nuclear arms at an early date and to nuclear disarmament, and on a treaty on general and complete disarmament under strict and effective international control” (Article VI). A breakthrough toward this goal came in July 2017 when the United Nations General Assembly voted to adopt the first legally binding international agreement that prohibited nuclear weapons. All of the nuclear weapon states and most of their allies, however, refused to participate in the treaty negotiations. Recently, Christopher Ashley Ford, assistant secretary of state for nonproliferation, has called the treaty as a “well-intended mistake,” insisting that a “better way” was to work within the NPT framework while taking steps to improve “the actual geopolitical conditions that countries face in the world.” If the IPCC is correct in its claim that we have only a little more than a decade to stop potentially catastrophic climate change, it is unlikely that the “pragmatic, conditions-focused program” described by Ford will significantly reduce risks of nuclear proliferation and militarized counter-proliferation in time. If so, then we must realize that the promotion of civilian nuclear power in a world of nuclear apartheid – a world in which the United States and its allies are not hesitant to use force to disarm and topple a hostile regime with nuclear ambition – may have no less catastrophic consequences for human society than climate change. Toshihiro Higuchi an assistant professor in the Edmund A. Walsh School of Foreign Service at Georgetown University. He is a historian of U.S. foreign relations in the 19th and 20th century. His research interests rest with science and politics in managing the trans-border and global environment. John Mueller, Atomic Obsession: Nuclear Alarmism from Hiroshima to Al-Qaeda (Oxford; New York: Oxford University Press, 2010), 161-179. Shane J. Maddock, Nuclear Apartheid: The Quest for American Atomic Supremacy from World War II to the Present (Chapel Hill: University of North Carolina Press, 2010), 1-2. Dan Reiter, “Preventive Attacks against Nuclear Programs and the ‘Success’ at Osiraq,” Nonproliferation Review 12, no. 2 (2005): 355-371; Leonard S. Spector and Avner Cohen, “Israel’s Airstrike on Syria’s Reactor: Implications for the Nonproliferation Regime,” Arms Control Today 38, no. 6 (2008): 15-21. Francis J. Gavin, Nuclear Statecraft: History and Strategy in America’s Atomic Age (Ithaca, NY: Cornell University Press, 2012), 75-76. William Burr and Jeffrey T. Richelson, “Whether to ‘Strangle the Baby in the Cradle’: The United States and the Chinese Nuclear Program, 1960-64,” International Security 25, no. 3 (2000/01): 55, 61-62. Also see Noam Kochavi, A Conflict Perpetuated: China Policy during the Kennedy Years (Westport, CT: Praeger, 2002). Document 49, Memorandum for the Record, September 15, 1964, in Foreign Relations of the United States, 1964-1968, vol. 30 (Washington: U.S.G.P.O., 1998). Bill Clinton, My Life (New York: Vintage, 2005), 591. Michael R. Gordon, “North Korea’s Huge Military Spurs New Strategy in South,” New York Times, February 6, 1994, 1. William J. Perry, My Journey at the Nuclear Brink (Stanford, CA: Stanford University Press, 2015), 106. Joel S. Wit, Daniel B. Poneman, and Robert L. Gallucci, Going Critical: The First North Korean Nuclear Crisis (Washington: Brookings Institution Press, 2003), 180. Perry, My Journey at the Nuclear Brink, 106.